Washington Wizards guards Bradley Beal and John Wall poured in 53 points combined, enough to hold off a late push from the Denver Nuggets, 112-102 on Wednesday. The race for the final playoff spot in the Western Conference just got a little bit tighter. A late surge in the fourth quarter by the Nuggets, which ultimately fell short, was kickstarted by rookie Jamal Murray, who finished with 17 points on 3-5 shooting from behind the arc. The Nuggets, who now sit only a game ahead of Portland for the final playoff spot, also received another big night from Gary Harris, who scored a career-high 26 points. The Wizards indeed found open shots as the Nuggets constant struggles guarding the opposing guards at the perimeter, doomed the team tonight. The Wizards found offense at will with Beal, Wall and Otto Porter Jr, a three-man lineup that ranks in the top-5 in almost every major category in the NBA. Wall finished with a game-high 30 points. Every time the Nuggets cut the lead to single digits in the fourth quarter, the Wizards answered. At the rim, from the perimeter and on-defense. Denver could never trim the Wizards late lead and eventually, a dagger three pointer from Otto Porter Jr. after the Wizards slipped out of a double-team put the game away. Denver was forced to mix up their line-up once again, inserting Mason Plumlee and Juancho Hernangomez into their starting line-up due to injuries/sickness from three of their starters. To say the Nuggets have been shorthanded lately, is an understatement. The Nuggets started their 26th different lineup of the season. This particular number, leads the NBA. Plumlee did give Denver quite the presence around the rim, finishing with 19 points and 10 rebounds, however had a scare in the fourth quarter, after being kicked in the family jewels. A kick that drew response from the Nuggets twitter account. Wilson Chandler finished with 21 in his second-straight impressive night on offense. 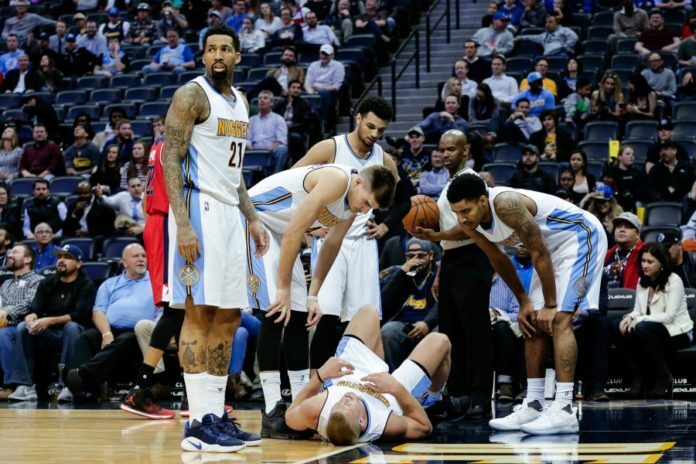 Three starters for the Nuggets: Nikola Jokic, Kenneth Faried and Danilo Gallinari all were out. The Nuggets are 1.0 game ahead of the Portland Trailblazers for the eithth and final seed in the Western Conference. It doesn’t get any easier for the Nuggets, as they welcome the 40-24 Boston Celtics to the Pepsi Center, Friday night.